Kelsey Futura remembers the first time she saw Portland Taiko perform. Originally from Seattle, Furuta saw the group play at the first regional taiko meetup in her hometown, showcasing groups from the Pacific Northwest. Taiko means "drum" in Japanese, and the word refers to several kinds of drums used in Japan for more than 1,400 years. Kumi-daiko is ensemble drumming, a type of taiko performance that is recent to the United States, Furuta said. "It is a fairly new artform, and in 1998 with the first regional gathering, it was the first time people were meeting each other from the area, and for me, it was the first time I learned about Portland Taiko," she said. "I was only 15 years old, and was struck by them. I knew someday I wanted to move to Portland to be a part of them." Many taiko groups later, Furuta reached her goal in 2009. She wears many hats at Portland Taiko, as a teacher, performer, performance coordinator and a member of the group's artistic leadership team. "When I first started at 10, I never really found anything that I liked. I wasn't sporty, I didn't dance, but when I found taiko, for some reason, it was something I really enjoyed," Furuta said. "It was so opposite of what I thought of about myself. I was a quiet and shy kid, but when I found these drums, I just loved it." Portland Taiko is celebrating its 25th anniversary as a group. Founded in 1994 by Ann Ishimaru, Zachary Semke and Japanese-American community activists, the group has blossomed over the years. It has headlined festivals and concerts, as well as released three albums. Portland Taiko has also performed for hundreds of community events and school assemblies. Portland Taiko takes the chance to teach the audience about the differently sized drums and the history of the art form, Members interact with the audience by showing them a basic drum roll. Performers ask volunteers to come up toward the end of the performance and try the drums, Futura said. "People say we look like we are having fun," she said. "To me, people connect when they see it is your passion." Not only does the group perform, but it teaches workshops and classes at the Oregon Buddhist Temple to children and adults, including Taiko 101. 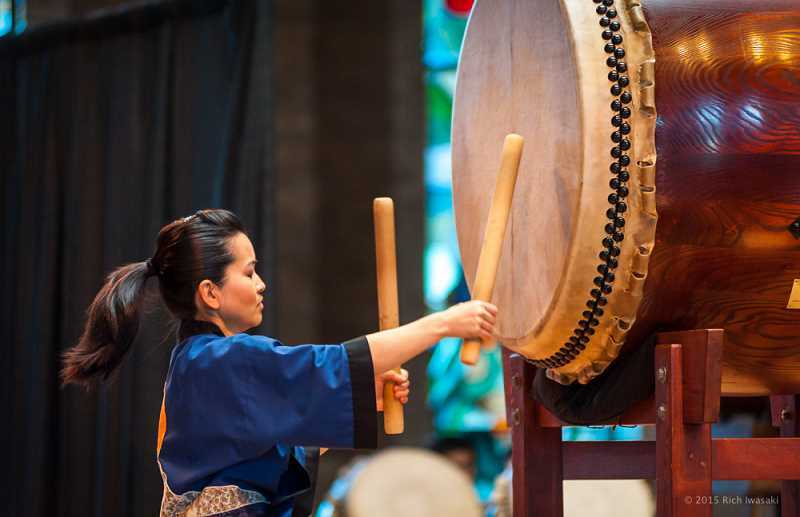 Taiko drumming in the United States has grown immensely since Furuta became involved, and continuing to perform and teach keeps the heritage and culture alive, she said. "Most people today have heard of taiko, or at least seen it on TV," Furuta said. "Ten years ago, I don't think it was as popular. The drum has been around forever in religious ceremonies and kubuki theaters, but drumming in an ensemble is a recent phenomenon, with it being in America since 1968." She added, "When you learn taiko, we all are responsible for its history, because we are in such an important part of it. It is so closely tied to the Japanese-American identity, especially in this region. It thrived in the 1970s in conjunction with the civil rights movement, and was a time when Asian Americans where fighting for their voices to be heard and when they fought for reparations from the incarceration of World War II. It was a place for unheard voices to be heard. Kumi-daiko should always be tied to that history." 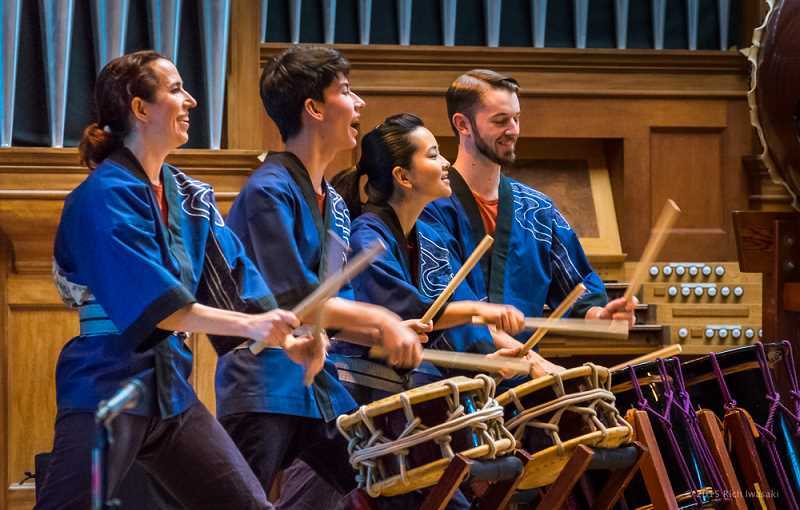 You can catch Portland Taiko's interactive, family-friendly performance — recommended for ages 4 and up — at 7:30 p.m. Friday, April 5, at the Glenn & Viola Walters Cultural Arts Center in Hillsboro. Tickets are $5 advance or $8 the day of show. For more information on its workshop on Wednesday, April 3, visit its Eventbrite page. Can't make it to either? The group is hosting a 25th anniversary celebration in Portland at 6 p.m. Friday, April 12. The event promises a festive evening of taiko performances and dinner at Wong's King Seafood Restaurant, 8733 S.E. Division St. in Portland.